These words of Minister of Education (MoE) the Hon. Delmaude Ryan greeted as she delivered the feature address at the National CXC awards ceremony held on Tuesday, February 24, 2015 at the Brades Arts and Education center. 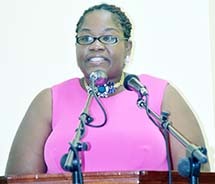 Miss Treviesha Lynch , Executive officer gave welcoming remarks and introduced Mr. Glen Francis, Director of Education in the sponsoring Ministry of Education of the awards to perform the master of ceremonies function for the ceremony, which he informed was being streamed live on www.liveislandevents.com. It was many years ago, Mr. Francis informed that the Caribbean Examination Council (CXC), “had suggested to participating territories, it was time to recognize the outstanding performances of our students, ”in the various CXC exams. Montserrat began doing so in 2003 when for four years following they gave out the awards during the annual fund-raising dinner for Sir Howard Fergus scholarship fund. 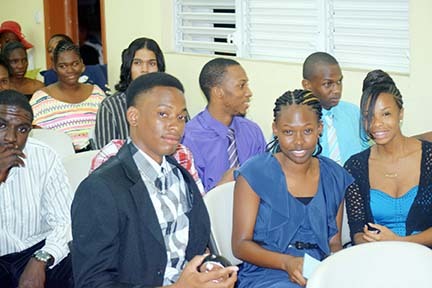 This year twenty seven (27) students were recognized for their outstanding performance in the 2014 CSEC/CXC examination and the Caribbean Primary Exit Assessment (CPEA). Students receiving five (5) subjects or more up to ten, were recognized with certificates and awards for their outstanding performances in their different subject exams. For the first time, primary school students were awarded for their commendable performances. The first set of awardees placed in the top five of CXC’s Caribbean Primary Exit Assessment (CPEA) received awards presented to them by the principals of the three primary schools that participated. Akyla Davis – Mrs. Claudia Skerritt, Headteacher of St. Augustine Primary. Stephaun Harris of the Brades Primary obtained an overall average of 87.2%. He was the first Overall Outstanding student in the CPEA examinations Mrs. Zelma White, Education Officer for Primary, presented the award. Five persons gained five (5) CXC passes; six students obtained passes in six (6) subjects; four successes in seven (7), and and three in eight subjects. Dauquan Wray, obtained nine (9) subjects. He was the recipient of the 2014 National CXC CSEC Overall Outstanding Student Award; while obtained Chekwube Okereke, obtained 10 subjects. Dauquan Wray received the award for: Most Outstanding Performance in Technical & Vocational Subjects; Most Outstanding Performance in the Sciences; and OVERALL OUTSTANDING ACHIEVEMENT AT CSEC LEVEL. The award was sponsored by the St. Patrick’s Co-operative Credit Union. As the winner of the outstanding achievement award, Daquan Wray on invitation to speak, gave reflections on their journey through secondary education, recalling how at the beginning, the “energetic group was quite rightly branded as unsettled. He placed emphasis that the time spent at MSS provided hope for tomorrow. In the CAPE awards section, Miss Tiffannie Skerritt, currently pursuing studies in medicine at University of the West Indies was the overall outstanding student, passing four (4) units with two grade ones, one grade two and one grade three. Other persons presenting awards included: the Hon. Minister Delmaude Ryan; Mrs. Cherlyn Hogan, Principal of the Montserrat Secondary School (MSS); Mrs. Hyacinth Bramble-Browne, Vice Principal MSS; Dr. Ian Tolan. acting Principal of the Montserrat Community College; Miss Sonja Smith, Chief Librarian; Mrs. Mary Lynch, Assistant Secretary; Mrs. Zelma White, Education Officer for Primary; Mr. Phillip Chambers, the Permanent Secretary in the Ministry of Education, Youth Affairs and Sports. MSS student Melick Richards opened with the Invocation, Miss Patricia Harris, Head Vocational dept. 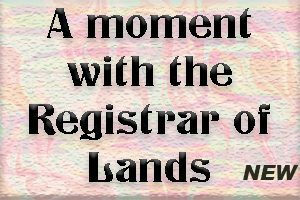 MSS read the Citations, while Miss Meredith Lynch MoE Executive Officer gave the vote of thanks.